The CM was taken back to the party after Mulayam's meeting with brother Shivpal. 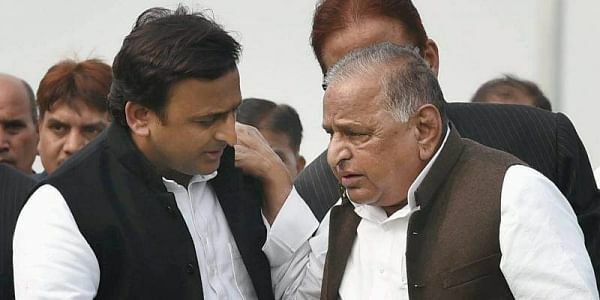 LUCKNOW:After a massive show of strength by Akhilesh Yadav, who was expelled from SP by father Mulayam Singh Yadav, the party supremo today backed down revoking with immediate effect the expulsion orders of his son and brother Ramgopal. After hectic confabulations involving Akhilesh Yadav's warring uncle Shivpal Yadav, Mulayam and the Chief Minister, Shivpal tweeted that on the SP supremo's directive, expulsion of Akhilesh and Ramgopal Yadav from SP was being revoked with immediate effect. "I am coming after having met party chief Mulayam Singh along with CM Akhilesh Yadav. Netaji has given the order that the suspension orders of Akhilesh and Ram Gopal are terminated with immediate effect," Shivpal said. "All of us together will fight communal forces and we will once again form a SP government in UP with full majority. These are my orders. We will hold discussions within ourselves and decide, and prepare for the upcoming elections," he said. "All matters have been solved and we will fight the upcoming polls together. We will all sit togther with Netaji and I am sure all problems will be resolved," he said. On a day of fast-paced developments, Akhilesh earlier in the day convened a meeting of SP legislators where over 200 of the 229 party MLAs turned up expressing their loyalty with the chief minister, a day after he was expelled from the party for indulging in "indiscipline", pushing the ruling party to the precipice of a vertical split. Some SP MLCs and senior party functionaries loyal to Akhilesh also attended the meeting at the chief minister's official residence at 5-Kalidas Marg.